Impatiens is one of the most popular annual flowers, due to their brightly color blooms and their ability to grow in shady areas. The most commonly grown cultivars are short plants, attaining a height of not more than 1 foot. Some types, such as the 'Super Elfin' series, stay much shorter. Impatiens flowers come in a variety of colors, including white, red, pink, violet, coral, purple, and (a relative newcomer) yellow. Impatiens flowers take their name from the Latin, impatiens, meaning "impatient." They are so called because their ripe seed pods will sometimes burst open from even a light touch (as if they were impatient to open). This characteristic is especially apparent in a relative named "jewelweed," which is indigenous to eastern North America. There are many kinds of impatiens flowers. Plant taxonomy classifies one of the more popular species as Impatiens walleriana, which includes the series of 'Super Elfin' ​cultivars. "Busy Lizzy" is one of the common names for this plant (the origin of which presumably lies in how "busy" this prolific bloomer is at producing blossoms), although this is a case where the scientific genus name is so widely used that it has virtually become a common name. Impatiens plants belong to the balsam family. Hardiness Zones: In hardiness zones 10 and 11, impatiens can be planted in the fall for winter and spring color. In shaded landscapes in zones 9,10, and 11, the plants can reseed themselves, maintaining year-round flowers in shaded areas. Perhaps the biggest advantage of the New Guinea type is its resistance to impatiens downy mildew. This disease is caused by a pathogen called Plasmopara obducens. In the wake of the spread of this disease, switching over to New Guineas became a no-brainer. A relatively recent hybrid put out by the folks at Sakata, going by the brand name, SunPatiens®, is said to be suitable for both full sun and partial shade. SunPatiens is resistant to impatiens downy mildew. In northern United States and areas with similarly cold winters, the traditional time for planting them is Memorial Day, when the danger of frost has passed. While the plant is quite popular, don't let the claim that this or that plant is "overused" hold too much sway over your buying decisions as an amateur gardener. If a particular color of impatiens helps fill a need in a flower border or anywhere else, especially in shaded areas, use it! Grow impatiens flowers in well-drained soil enriched with hummus. Because they require a good amount of water, the soil must drain well. The soil should also be moist and deeply shaded. Although with sufficient water they can be grown in partial sun in northerly regions, their great virtue is that they thrive in the shade. In fact, they're among the relatively few readily available, inexpensive flowering plants that will put on a great floral display even when grown in full shade. Once in the ground, the impatiens will need at least 2 inches of water a week. They are quite sensitive to heat. If your temperatures rise above 85 degrees Fahrenheit, they will require at least 4 inches of water per week. Container impatiens will need daily watering and twice daily if temperatures are above 85 degrees Fahrenheit. They are quite sensitive to water. If there has been a long, dry spell, your plants will likely look wilted. Thankfully, they bounce back quickly. Give them some water and they will perk back up. Impatiens are tropical plants. Once the first frost comes, they will turn to mush. Bring them indoors if you plan to winter them indoors during the colder months. They are fine in humid weather. 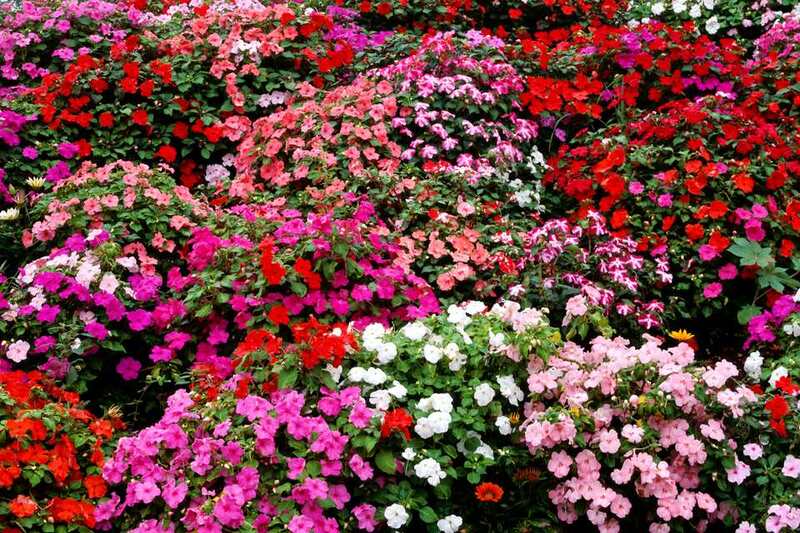 The impatiens flowers will look best if regularly fertilized. A water-soluble fertilizer can be used every two weeks throughout the spring and summer. Another option is a slow release fertilizer used at the beginning of the spring and again, halfway through the summer. If your impatiens plants start looking leggy late in the summer, use scissors to trim off the top third of their vegetation. This will promote the emergence of new blooms and improve the overall appearance of the plants. One possible cause of legginess is over-fertilization. Perennial impatiens (Impatiens walleriana): The most common in North America, it is grown as a perennial in most of North America. Annual impatiens (Impatiens balsamina): Often called garden balsam or rose balsam, they are considerably smaller, with cup-shaped flowers. These have become less popular. New Guinea impatiens (Impatiens hawkeri): These have larger flowers, more varied colors, and are able to tolerate full sun. Jewelweed and Touch-Me-Not (Impatiens capensis and Impatiens pallida): Two wildflowers species, they are closely related to annual and perennial impatiens.